Public health experts and scientists are sounding the alarm to policymakers about the serious public health problem of pregnant women’s exposure to pesticides and cognitive problems in their children. Even very low levels of exposure to certain organophosphate pesticides (such as the residue present on commercial/non-organic produce and processed foods) have been linked to lower IQ, memory problems, attention deficit problems and memory and learning problems in their children. 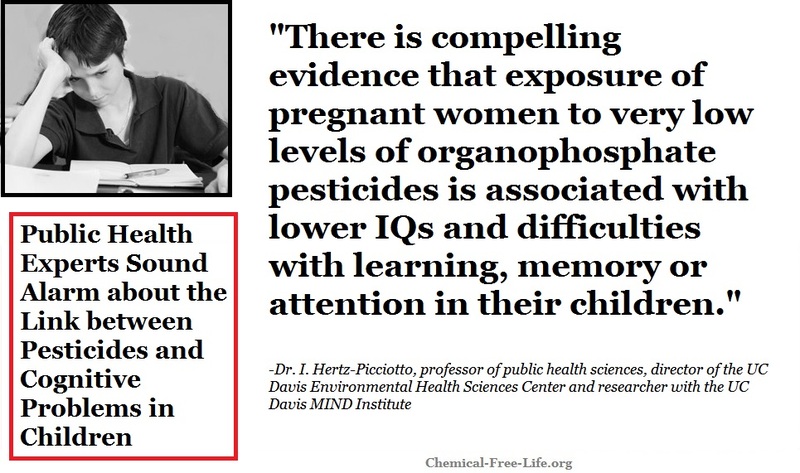 “There is compelling evidence that exposure of pregnant women to very low levels of organophosphate pesticides is associated with lower IQs and difficulties with learning, memory or attention in their children. -Dr. Irva Hertz-Picciotto, professor of public health sciences, director of the UC Davis Environmental Health Sciences Center and researcher with the UC Davis MIND Institute. What and where are these dangerous pesticides? People can come into contact with these chemicals through the food they eat, the water they drink and the air they breathe. As a result, organophosphate pesticides are detected in the vast majority of U.S. residents. Since even “very low levels” of exposure to these pesticides during pregnancy hold the potential for adversely affecting childhood IQ, memory, learning, and other cognitive difficulties in children, pregnant couples and those planning on becoming pregnant may want to use an abundance of caution including minimizing highly processed foods, and eating organic versions of whole foods, drinking bottled water and avoid spending time in places where these pesticides are commonly used such as gold courses and shopping malls. Additionally, you may want to check with your employer and apartment or condo complex to learn the type and frequency of pesticides used.